For other uses, see Zulfiqar (disambiguation). 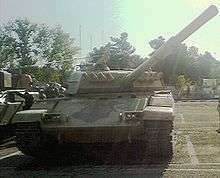 An Iranian Army Zulfiqar-3 in September 2012. 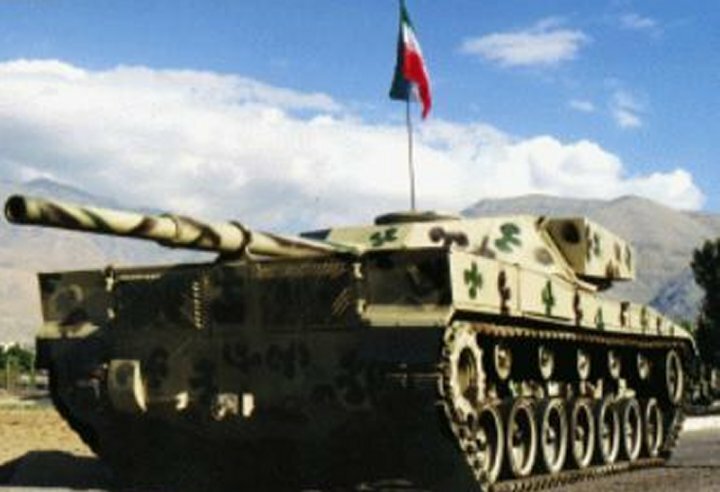 Zulfiqar (ذوالفقار) is an Iranian main battle tank (MBT), conceived by Brigadier General Mir-Younes Masoumzadeh, deputy ground force commander for research and self-sufficiency of the armed forces. It is named after Zulfiqar, the legendary sword of Ali, the fourth Caliph and the first Shiite Imam. The test prototypes of the tank were evaluated in 1993. Six semi-industrial prototypes of the tank were produced and tested in 1997. The tank has a distinctive box-shaped, steel-welded turret of local design. The Zulfiqar is believed to be developed from major components of the Soviet T-72 and American M48 and M60 tanks. The suspension is modelled on the M48 /M60 Patton tanks supplied to Iran by the U.S. The SPAT 1200 transmission also seems to be a local development of that of the M-60. Zulfiqar-1's combat weight has been reported to be 36 tonnes with a 780 hp diesel engine; giving the tank a 21.7 hp per ton ratio. Some sources see resemblances between the Zulfiqar design and the Brazilian prototype Osório. In October 2016, Iran claimed they had successfully tested an active protection system on the Zulfiqar, based on pulse-doppler and phased-array radar systems equipped with four arms systems that can cover a full 360-degrees of sight. The tank is armed with a 125 mm smoothbore gun 2A46 derived from that of the T-72, which is fitted with a fume extractor. Its secondary armament consists of a 7.62 mm coaxial and a 12.7 mm machine gun. For the Zulfiqar/T-72 fleet, the Ammunition Group of the Iranian Defense Industries Organization mass-produces a standard high explosive 23 kilograms (51 lb) propellant charge which fires the 3 kg warhead at a muzzle velocity of 850 metres per second (2,800 ft/s). The Zulfiqar-1 uses the Slovenian EFCS-3 fire control system, the same model used on the Type 72Z ("Safir-74"), providing 'fire-on-the-move' technology. The Zulfiqar allegedly mounts a laser-warning pod on the turret. Its design enables the tank to use an Iranian-made package of reactive armor. The Zulfiqar-1 is based on the M60 Patton model acquired under the pre-revolution era. The Zulfiqar-1 was first revealed in public in 1994. A total of six prototypes were completed and field tested in 1997. The Zulfiqar-1 is protected by a welded steel hull and the turret is reinforced by a composite armour. The Zulfiqar-1 is armed with a 125mm Smoothbore gun taken from a T-72. The Zulfiqar-2 is an interim main battle tank prototype used as a test bed. This variant is fitted with a new and more powerful engine. It has an extended chassis and possibly uses an improved autoloader. The Zulfiqar-3 is the most advanced variant of the Zulfiqar family. It features considerable upgrades to the fire control system, chassis, engine and main gun. The new variant is equipped with the 2A46 125 mm smoothbore cannon with an autoloader, a laser rangefinder and a new fire control system. It is also fitted with a reinforced turret and the wheels are covered by an armoured skirt. ↑ "Archived copy". Archived from the original on May 3, 2011. Retrieved February 12, 2010. 1 2 John Pike. "Zulfiqar". Retrieved 13 November 2014. ↑ "Commander: Upgraded Zolfaqar Tanks under Field Tests". Retrieved 2010-09-06. ↑ "Zulfiqar 2 Main Battle Tank". Retrieved 2010-04-06. ↑ "The Zulfiqar 2 main battle tank". Retrieved 2010-04-06. ↑ "Iranian Army plans to unveil tomorrow optimized version of its home-made main battle tank Zolfaqar". Retrieved 13 November 2014. ↑ "Iran to Unveil New Generation of Zolfaqar Tanks". Retrieved 2010-05-18. ↑ "The Iranian Zulfiqar Main Battle Tank". Archived from the original on May 3, 2011. Retrieved 12 February 2010. ↑ "Latest generation of Iranian-made main battle tank Zulfiqar with new reactive armor". June 4, 2013.